A huge thank you to the Jares family for donating all of these books to our students in memory of their mother Helen Jares. 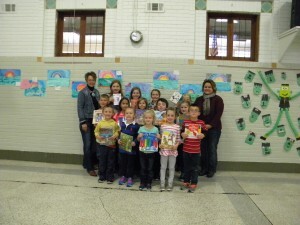 The Jares family had 14 kids in their family and they all attended Sacred Heart Area School! The family also made a donation to our school scholarship fund! Thank you Jares family! 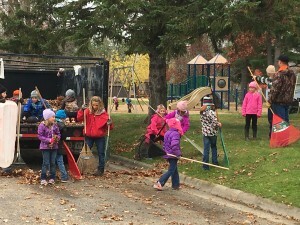 On Wednesday, October 19, the students of Sacred Heart Area School had their annual work-athon. 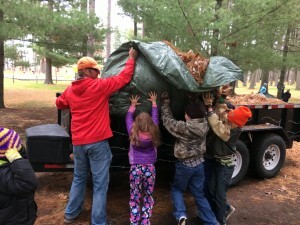 They raked leaves, picked up sticks, and pine-needles in the Staples city parks. Students asked community members for pledges toward their work to raise money for their school, raising over $8000 to meet their goal. The work-athon replaced the marathon where students in the past would ride bike or walk to collect pledges for their Catholic school. This work-athon teaches students both good citizenship and discipleship. Great work boys and girls!